Summer Camp Music Festival has announced plans for integrated permaculture education into the festival offerings. In collaboration with several educational entities, the music festival will join a short list of events across the nation that are now offering educational and learning opportunities prior to the main event. A goal of the effort is to donate infrastructure to civic organizations supporting community gardens. 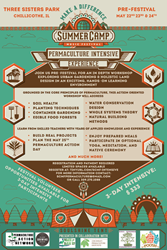 From Sunday, May 22nd to Tuesday, May 24th 2016, the Permaculture Intensive Experience will host registered guests in Chillicothe, IL for three days of learning; the cost of participation being $333. The action-oriented workshop will address natural building methods, soil health, water design integration, planting techniques, edible food forests, container gardening, and much more. The complete immersion event includes prepared meals, camping, morning ceremony, evening discussions and a dynamic learning environment. The pre-festival event will take place on the festival grounds, Three Sisters Park, near the Make a Difference Soulshine Tent, which is host to the ecological and socially conscious focused programming during the festival weekend. As part of the curriculum, participants will build garden installations that will educate the festival patrons. As the ongoing expansion of the festival’s Make a Difference educational programming, the workshop will prepare students with a series of techniques to take action and transform any space after the course. The program will also provide to the local community. On Wednesday, May 25th, students will have the option to guide a Permaculture Action Day, using newfound knowledge and skills in a practical leadership application, transforming the landscape of 7 Circles Heritage Center (Edwards, IL) through the principles of permaculture. At the conclusion of the festival, the effort aims to enhance the local food movement, gifting many of the garden displays to civic and educational organizations in the neighboring community. The intensive will be facilitated by a collective of teachers who have studied the course concepts both internationally and domestically and boast years of applied knowledge, offering a broad and practical perspective. Educators of the 2016 course include contributions from Soul Springs Farm (Michigan), Clear Creek Schoolhouse (Kentucky), thePOOSH.org (Kentucky), Columbus Growing Collective (Ohio), Diverse Metamorphosis (Illinois), and the Permaculture Action Network. Nick Algee is a project manager, community organizer and consultant who has been producing events for a decade and a half. Nick has led award-winning waste management teams, facilitated multi-day conferences and evolved educational spaces for several events. Nick has studied growth management and environmental studies, is a certified permaculture designer and a certified yoga instructor. Since 2001, the Summer Camp Music Festival has transformed the grounds annually, welcoming an increasing number of fans and musical acts. This event now hosts more than 20,000 attendees and 100 bands on seven stages over three days, as well as workshops, live art, and sustainability initiatives. Summer Camp is the biggest event in the Midwest every Memorial Day Weekend. For more info and to secure registration for the permaculture learning, visit: http://tinyurl.com/SMCFpermaculture. To purchase tickets for the main event, go to: http://summercampfestival.com/tickets/. Make A Difference provides programming at Summer Camp Music Festival to increase social and environmental awareness by exploring a wide range of activities at the festival, and throughout the year. Summer Camp Music Festival is produced by Jay Goldberg Events & Entertainment; founded in 1971 to promote major live music concerts and to produce and develop festivals and special events. With offices based in central Illinois, SW Florida and South America, Jay Goldberg Events and Entertainment has produced concerts and individual events throughout the Midwest and other markets from Las Vegas and SW Florida to Buenos Aires, Argentina.